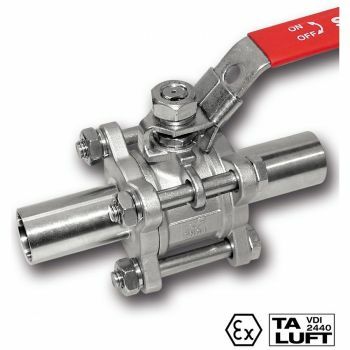 Stainless Ball valves have proven their worth in many applications as very reliable and compact shut-off valves. Various types such as 2-way, 3-and 4-way ball valves in conjunction with various spherical bore sizes can be combined depending on the application and use. Ball valves provide fast and precise switching due to their simple structure. Housing and ball made of 1.4408. Sealing material PTFE, for screw pin to DIN 3852 Part 2 Form A. Investment casting, hexagon, reduced bore, with lever. 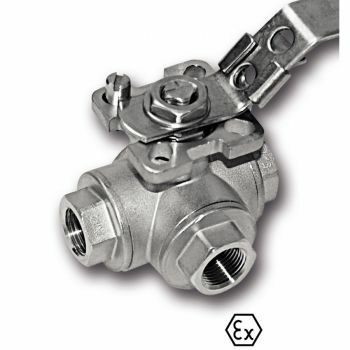 Parallel BSP thread to DIN/ISO 228 Application:The stainless ball valves from 1 pieces are designed to be used as shut-off valves for corrosive and non-corrosive liquids, gases, vapours an.. Application:The stainless ball valves from 1 piecе is designed to be used as shut-off valves for corrosive and non-corrosive liquids, gases, vapours and loose materials. Medium may flow in both directions through the ball valves. Thanks to their simple design and reliable function, the ball valves made of one piece can be used in food, chemical, pe..
Three Piece Stainless Ball Valve - welding endsOpen passageWelding ends on both sides. Housing and ball made of 1.4408.Sealing material PTFE / glass fibre 15%. S: Length conforms to DIN 3202 S13..
Housing and ball made of 1.4408. 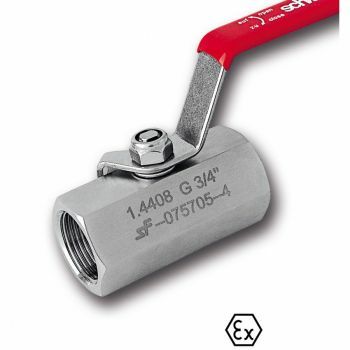 Sealing material: PTFE / FKM, with L- or T-bore, 90 ° switching, with parallel BSP thread according to DIN / ISO 228 Application:The 3 way stainless ball valves from 1 pieces are designed to be used as shut-off valves for corrosive and non-corrosive liquids, gases, vapours and loose materials. Technic.. 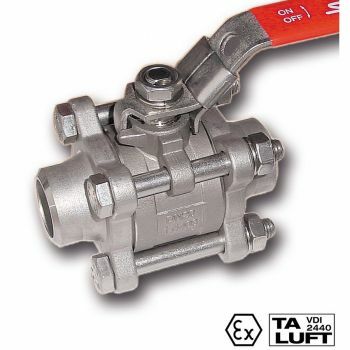 Application:The ball valves are designed to be used as shut-off valves for corrosive and non-corrosive liquids, gases, vapours and loose materials. Medium may fl ow in both directions through the ball valves. Thanks to their simple design and reliable function, the ball valves can be used in food, chemical, petrochemical and pharmaceutical industri.. 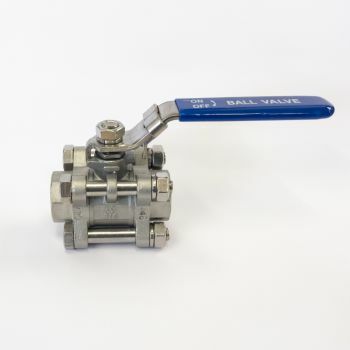 Application: The stainless steel 2 pieces threaded ball valves are designed to be used as shut-off valves for corrosive and non-corrosive liquids, gases, vapours and loose materials. Medium may fl ow in both directions through the ball valves. 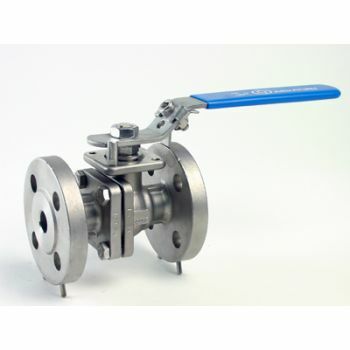 Thanks to their simple design and reliable function, the ball valves can be used in food, chemical, petro.. 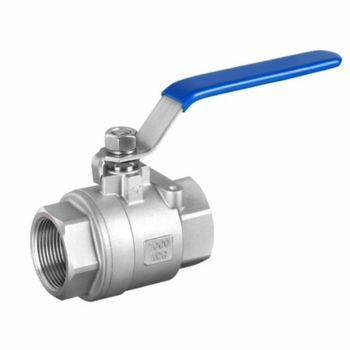 Application:The stainless ball valves from 3 pieces are designed to be used as shut-off valves for corrosive and non-corrosive liquids, gases, vapours and loose materials. Medium may fl ow in both directions through the ball valves. 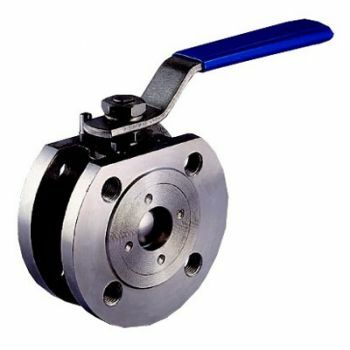 Thanks to their simple design and reliable function, the ball valves can be used in food, chemical, petrochemical and.. Application:The flanged stainless ball valves from 3 pieces are designed to be used as shut-off valves for corrosive and non-corrosive liquids, gases, vapours and loose materials. Medium may fl ow in both directions through the ball valves. 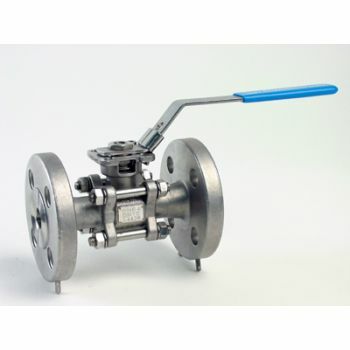 Thanks to their simple design and reliable function, the ball valves can be used in food, chemical, petrochem..